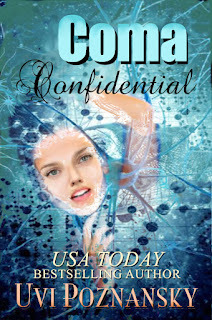 Coma Confidential, by Uvi Poznansky, is the latest release from this USA Today Bestselling Author. Ms. Poznansky has successfully experimented with a new dimension of genre here, in what I’d call a delicious psychological thriller. Told from the point of view of a comatose patient, Coma Confidential is brilliantly conceived and finely executed. In the first part of the book, the patient—whom we later discover is named Ash—can only hear sounds around her. She knows the tapping sounds in the hallway match certain nurse’s and doctor’s footsteps. Fully aware of her surroundings, she can’t communicate. She lives in a dark world where the staff buzz around her, talking about her as if she’s probably a lost cause. Completely alone and confused, she doesn’t know her name or have any idea what put her in the hospital in this coma. The aroma of donuts tells her the policeman is back on his shift… but why is he guarding her? Later, a strangely familiar voice with a Russian accent sends adrenaline whooshing through her body…but why? Little by little, Ash unravels the mystery of what landed her in the hospital and why she’s in terrible danger. And day by day, parts of her body begin to awaken. At first it’s a twinge in her toe. Soon she can open her eyes. But she realizes that revealing that she’s coming back may sign her death warrant, so she keeps her gradual awakening a secret. When the power systems start failing randomly in the neighborhood and within the hospital, Ash is worried. She still needs machinery to help her stay alive. What will happen to her if the power doesn’t come back next time? This suspenseful story spins into a wild race for survival for Ash, filled with terror, courage, and a journey that will have you cheering her on. Coma Confidential is the second in the Ash Suspense Thrillers series, but it completely stands alone and there’s no need to read book one first in order to enjoy this intriguing tale!